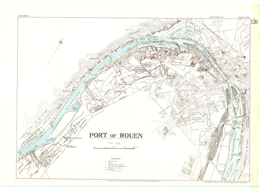 This is a 1:15,000 scale map of the Port of Rouen, France. It was published in March 1943 by the Inter-Service Topographical Department of the War office of Great Britain, under the superintendence of Vice-Admiral Sir John Edgell, KBE CB, Hydrographer. This map is GSGS Miscellaneous (Misc) Map 68.